Game Lair is the best place to buy, sell, trade, or repair any game, console or accessory. 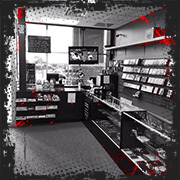 We are open 7 days a week to better serve Sioux City with all you gaming needs. From new releases to vintage favorites we carry it all. If it’s not in the store, we’ll get it for you. We stay current with the hottest trends in gaming and still stay true to our roots by having one of the largest selection in retro games and consoles. © 2016 Game Lair. All rights reserved.